The odds on me telling you to watch this pretentious yawnfest are virtually zilch. Harsh? Maybe. But I have never been so bored and disappointed with a film in some time. Mark Wahlberg and Rupert Wyatt take on the remake of the cult Caan crime caper and, to be honest, by the end I couldn’t help wondering why? So what’s it all about? Lit professor and gambler Jim Bennett’s (Wahlberg) debt causes him to borrow money from his mother (Jessica Lange) and a loan shark (Michael Kenneth Williams). Further complicating his situation is his relationship with one of his students (Brie Larson). Will Bennett risk his life for a second chance? Now I will be honest. I haven’t seen the original. But I certainly want to now. Surely if the purpose of a remake is to be a re-imagining or an improvement on the original, than it must be terrible, right? Hmmm . . . The opening 15-20 minutes was slow-burning but seemed to set everything in motion. 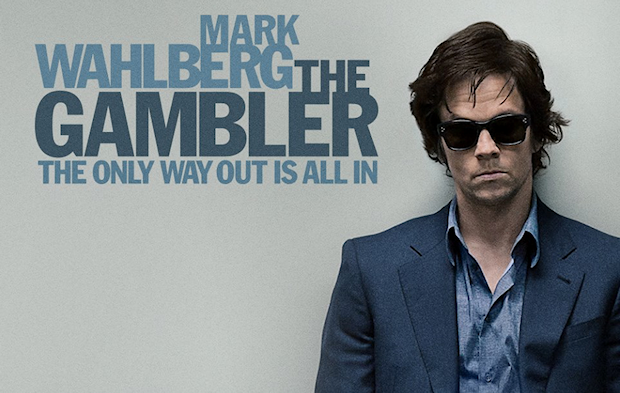 The moments in which Wahlberg’s Bennett gambles is tense and utterly bonkers. Showing how easy it is to fall into an addiction. The adrenaline rush. The complete disregard. Clocking up debts left, right and centre. However these are only moments. In between these tense tidbits, we are left with uninteresting characters, a lot of mindless exposition and barely any action or suspense that the film seemed to promise. Wahlberg certainly did his best but his character was such a deluded self-deprecating simpleton that there was only ever going to be two outcomes. Two outcomes that were predictable and made the whole thing a waste of time. Larson (21 Jump Street) and Wahlberg managed to convey a little chemistry but Bennett was such an egotistical and unlikeable character that you felt Larson’s Amy was getting what she deserved for being such a silly little girl. Jessica Lange (American Horror Story) was good as Bennett’s mother but there wasn’t enough of her. Her fiery interactions with her son made things a little bit more interesting but were either skipped over so quickly or left open that it made it all rather flat. It would have been nice to have had a little more insight into their fractious relationship. Not little arguments, pointless flashbacks and a strange opening scene with a cathartic cameo from George Kennedy. What infuriated me was how many opportunities Bennett had to get out of his mess but continued to cause hassle, borrow money and gamble it away. I was thinking, “You’re getting what you deserve, mate”. Wyatt certainly captures the gruelling stakes of gambling with a man so frustrated with life that he is on this nihilistic path BUT it could have been done a lot better and a good portion shorter. The classroom scenes felt one big rant at life. Philosophical meanderings that I’m sure were supposed to come of clever and thought provoking just came off pretentious, overlong and pointless. If it was supposed to show the yearning desire between Larson and Marky Mark, it didn’t. If it was supposed to reveal more of Bennett’s character, it did a little. Only that he is a plonker. A waste of a talented supporting cast. You had a menacing (but incredibly fat and bald) John Goodman and Michael Kenneth (Omar from The Wire/Chalky White from Boardwalk Empire) at the helm of two very angry looking gangs. All that supposedly cryptic, suspenseful and threatening dialogue leading to . . .
More talking and more pointless meetings. Don’t get me wrong, Williams and Goodman do their utmost to make as memorable a mark as they can with the material. Goodman was particularly impressive in the small part he had. BUT alas, it was done all too quickly, predictably and the final moments were unbelievably corny. To be honest, one revelation certainly made one of Wahlberg’s rants not complete jibberish. Greig Fraser’s cinematography certainly made this droll affair look stylish. BUT I was disappointed by Wyatt after he successfully managed to rework a franchise that I didn’t want rebooting (Rise of The Planet of the Apes). I wanted a broody, stylish cryptic crime caper with one man battling his addiction. To an extent, you do. But it certainly isn’t what you want or hope for. I’d gamble my chip on something else. I would recommend to people who are still interested; just watch the trailer. Two minutes tells you everything and it will save you two hours of pretentious, feeble waffle that amounts to nothing. Unfortunately, Marky Mark I didn’t pick up any good vibrations this time around. I watched this film, well half of it and fell asleep. It’s been 3 weeks and I still haven’t got round to watching the rest, probably never will lol.